Are you a cutting-edge marketing professional looking to drive revenue predicatively and consistently? 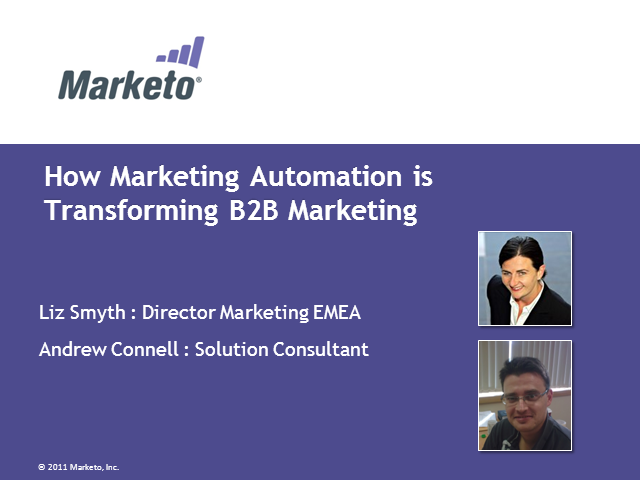 If so, join Elizabeth Smyth and Andrew Connell from Marketo for a webcast to find out how marketing automation can get you there. Marketing automation is both a tool for increasing operational efficiency and a tool for driving revenue. It is about automating the routine and repeatable tasks associated with lead management, lead nurturing, lead scoring, (and creating and maintaining a marketing lead database.) Done right, it can help marketing organizations improve their productivity as well as their collaboration with sales organisations. Automation software enables marketing departments to measure what works and demonstrate impact on revenue, and by integrating with existing sales force automation systems, it enables marketing to become a true partner with sales throughout the lead management process. • Marketers nurture, score and deliver greater numbers of qualified leads. • Sales reps see online behaviours to identify the hottest leads and opportunities. • Companies measure and predict the impact each program will have on revenue. • Marketers deliver more successful campaigns, higher conversion rates and better qualified leads. • Marketing and sales work together in entirely new ways to achieve unprecedented performance.